David Leonhardt has been following a bizarre trend that offers a mythical silver lining to the jobocalypse of 2009. Wages are rising -- sort of! As always, Leonhardt offers a sensible and clear-minded breakdown of what's going on. In a nutshell, we're seeing sticky wages, sticky jobs and sticky deflation. The result is the illusion of rising wages. Even in severe recessions, employers are usually unwilling to cut wages drastically for fear that workers will either lose motivation or bolt for other firms. We call that the theory of sticky wages. In this recesssion, historically slow churn in the job market means that instead of lots of firings and some hirings, we're seeing moderate firings and very few hirings. Employers are hoarding their workers, and forcing more of them to go into part-time to stock up for when the economy bounces back. I'll call that the phenomenon of sticky jobs -- and sticky joblessness. The upshot of sticky wages and relatively sticky jobs (and joblessness) is that wages have mostly flat-lined in the last year. But Leonhardt's graph here suggests real wages are rising. 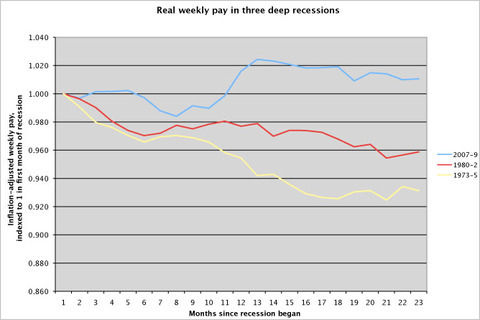 About two years after the start of the mid-1970s recession, real weekly pay was down 7 percent. By 1982, it was down 4 percent. But today real pay is 1 percent higher than in December 2007. What's going on here? Deflation, deflation, deflation! We've seen varying degrees of deflation since March, whereas neither the 1970s nor the 1980s recessions experienced negative inflation. In fact, between 1973 and 1975, inflation soared from 3 percent to 12 percent. Falling prices make flat pay feel like a wage increase when you go to the grocery store because the buying power of the dollars increases. For Americans in the sticky jobs, perhaps it's a welcome relief that helps offset the year in investment losses. But for the economy, deflation is very bad news because falling demand leads to falling production, which leads to job losses. So I'm not sure if that graph above is good news, or bad news with lipstick.